UBC Gunn IMS Certification. Now offering both parts 1 and 2 in Ontario. A UBC Faculty of Medicine Continuing Education Course. Gunn IMS offers treatment and rehabilitation solutions for patients with persistent musculoskeletal pain conditions. You will learn to recognise and treat both the myofascial and neural (wiring) component of the recalcitrant problems you face in your every day practice to achieve management success with this patient group. Our comprehensive training not only teaches you how to utilize dry needles safely and effectively, but also provides an evidence-informed rationale for effectively integrating dry needling into your practice with your most challenging patients. 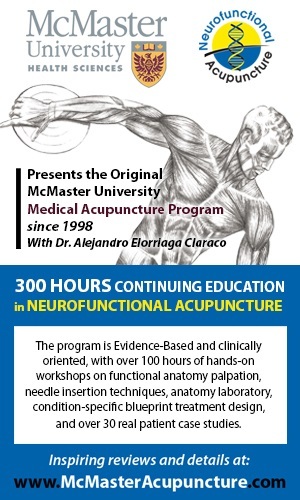 This is an intramuscular dry needling course that goes beyond trigger point dry needling. Gunn IMS is a total system for the diagnosis and treatment of persistent myofascial pain syndromes, including muscle, joint, tendon, bursal, fascial, neural and biomechanical problems. The approach is based on a neuropathic model of musculoskeletal dysfunction developed by Dr C. Chan Gunn and described in his book “The Gunn Approach to the Treatment of Chronic Pain”. His conceptual framework explains patterns of physical findings commonly seen in persistent myofascial pain syndromes and has been commended by many physicians practising in the field of chronic pain including John D. Loeser, Stephen Butler and Anders E. Sola. Patrick D. Wall describes Dr Gunn’s approach as being, “in the best of the traditions of classical medicine”. Dr Gunn has endowed UBC with the responsibility for the ongoing teaching of the Gunn IMS model of treatment - a teaching program that has run continuously since 1994. Since 2013, the Gunn IMS Program has been part of the UBC Faculty of Medicine and is now located in the Chan Gunn Pavilion on the UBC Vancouver campus. The course is coordinated by UBC Faculty of Medicine 's Continuing Professional Development Division, which has certified and granted the course 27 Mainpro+® credits for physicians. All course proceeds are used to support program development and research in Gunn IMS. The program’s focus is the safe, effective management of neuropathic musculoskeletal problems, using intramuscular dry needling and related postural and rehabilitative concepts. The application of the model requires an advanced level of clinical reasoning and pattern recognition, mature clinical judgement, extensive anatomical knowledge and precise palpation skills. For this reason, the prerequisites for attending this course include a minimum of four years experience treating musculoskeletal conditions. This is a two-part course - on successful completion of both parts of the program, participants will be awarded certification in UBC Gunn IMS. Part 1 of the course (4 days) covers education regarding Dr Gunn’s neuropathic model of myofascial pain syndromes, the effects of dry needling, and contraindications and safety considerations for dry needling (including avoiding serious complications). You will learn how to conduct and interpret an assessment based on the neuropathic model to determine the cause of myofascial pain syndromes, which can then be used to devise a treatment plan using the Gunn IMS model. Also, on Part 1, you will learn to safely and effectively dry needle muscles of the cervical and lumbar spine; shoulder and pelvic girdles; and upper and lower limbs. Part 2 of the course (3 days) focusses on clinical reasoning related to application of the neuropathic model of treatment. Also, on Part 2, you will learn safe and effective needling of muscles that are more technically-demanding and carry greater risk of adverse effects, including the thoracic spine and TMJ. Application forms and online application can be found at: http://www.ubcgunnimsmembers.com under the “Course Listings” tab.